People say you can’t even step out your front door these days. That’s certainly the case if a 1,000-tonne piece of nuclear submarine happens to be rolling down your street. But that is exactly what happened in Barrow in Cumbria on Sunday, when a submarine unit weighing more than 1,000 tonnes was transported to an indoor shipping complex. The unit belonging to defence company BAE Systems is the heaviest ever moved and was taken to Devonshire Dock Hall in Barrow-in-Furness from the New Assembly Shop in Bridge Road, Barrow. The unit will form part of an Astute class nuclear-powered submarine. Two such submarines – HMS Astute and HMS Ambush – are already in service. Four more submarines are being constructed at Barrow: Audacious, Anson, Agamemnon and an as-yet-unnamed submarine. BAE Systems was awarded the contract for the fifth submarine last month, taking the total value for work on the vessel to £1.3 billion. Manufacture of the submarine began in 2010 and HMS Anson is on schedule to begin sea trials in 2020. This entry was posted in UK Submarines and tagged Astute Class, BAE Systems, Barrow in Furness, Devonshire Dock Hall, HMS Anson, Submarine on December 15, 2015 by jasonlockley. THE latest super sub to be built in Barrow has been christened during a dramatic naming ceremony. 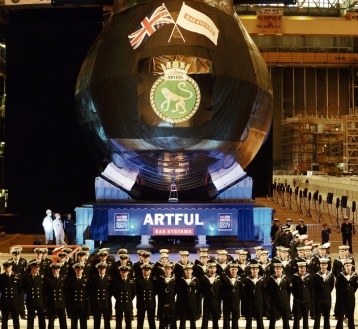 Artful, the third Astute-class submarine, is set to take its first dip into the water at the beginning of next year, and yesterday, Royal Navy bosses, local dignitaries and cadets poured inside the Devonshire Dock Hall to witness the boat’s naming ceremony. A small section of the hall was cordoned off with black and white voile curtains, with glimpses of the submarine visible from behind. As the ceremony began, the curtains fell one by one, to reveal the 7,400-tonne boat. The naming was carried out by Amanda Lady Zambellas, wife of the Royal Navy’s First Sea Lord, Admiral Sir George Zambellas. The symbolic smashing of a bottle of beer against the boat’s bow drew some gasps from the crowds as it failed to smash on the first attempt. According to naval folklore, if the bottle fails to smash, the ship will be destined for an unlucky life at sea. However, John Hudson, managing director of BAE Systems Maritime – Submarines in Barrow, was not concerned. “I’m not at all superstitious,” he said smiling. The 97-metre long submarine will be followed by a further four boats and preparation is continuing for the Royal Navy’s next fleet of submarines – a replacement for the Vanguard boats. A final decision – known as “Main Gate” – is due to be made after the next general election, and both Mr Hudson and Rear Admiral Simon Lister are confident about the Successor programme. Rear Admiral Lister, who visits the shipyard three times a month to monitor progress of the Astute programme, told the Evening Mail: “I am confident we will make a good proposal for Successor. Those who attended the ceremony, including many of the shipyard’s 5,000 workers, were treated to a performance by Ulverston Victoria High School’s Big Band. Many of the engineers, welders and technicians who have been involved in Artful’s build were able to watch the ceremony. The creature on the boat’s crest, chosen in 1945 by the Admiralty’s advisor on heraldry for the first Artful, is an unspecified species of primate. This entry was posted in UK Submarines and tagged Admiral George Zambellas, Astute, Devonshire Dock Hall, HMS Artful, John Hudson, Rear Admiral Simon Lister, Submarine on September 23, 2013 by jasonlockley. THE next generation of engineers have been inspired by the opportunities ahead for them to be involved in designing and building the world’s most technically advanced nuclear submarines – right here on their doorstep. Secondary and college students were amazed as they ventured through the giant doors of Devonshire Dock Hall at BAE Systems Maritime – Submarines, to see Astute class submarines at various stages of construction. Future Engineers Day at BAE Systems saw 100 year nine students from Furness secondary schools, and 20 post-16 college students, experience Barrow’s shipyard first hand. The day was run in partnership with Barrow Engineering Project, which is supported by the Royal Academy of Engineering, during National Science and Engineering Week. 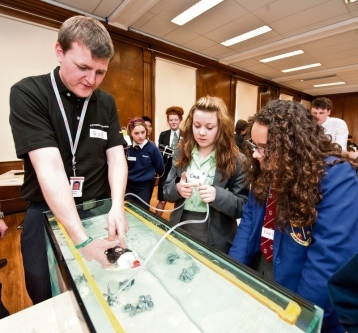 This was the third Future Engineers Day, and it showcased to students how science, technology, engineering and maths can be used in successful careers in Barrow with the global defence company. Alan Dunn, operations director at BAE Systems, spoke to the students about the Astute programme and the future Successor project. He also explained the importance of team work at the business which has a workforce of around 5,000 people. 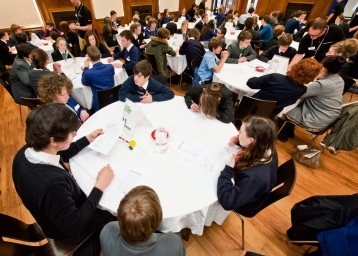 The day involved a team challenge, where the students would work in mixed teams with young people from different schools. Each team also had a college student mentor. The task was devised and set by the BAE Systems STEM ambassadors, who were overseeing the progress of the teams. The ambassadors have also been working with the college students on various projects. The challenge was set around Archimedes’ buoyancy principle. The teams were told that there was sunken cargo off the coast of Barrow and they needed to retrieve it. They were required to design a vessel that could sink and rise to the surface again. The students had to take on team roles, use their budget to buy materials, then design, build and eventually test their creation in a tank of water. The students also benefited from hearing directly from people who have joined BAE Systems through different pathways, such as a graduate, a trainee and an apprentice. Laura Lake, a communications advisor at BAE Systems, who organised the event with the partners, thanked all those who had contributed to making the event a great success. Mrs Lake said that BAE Systems staff had praised the students for how well they had worked together and adjusted to the challenge. She said: “We want to show young people that engineering is fun and a great career. “The DDH visit is a real highlight of the day. It is awe inspiring for the students. “It was quite a hard challenge that was set and it required teamwork. This entry was posted in UK Submarines and tagged BAE Systems, Barrow, Devonshire Dock Hall, National Science and Engineering week, Royal Academy of Engineering on March 27, 2013 by jasonlockley.